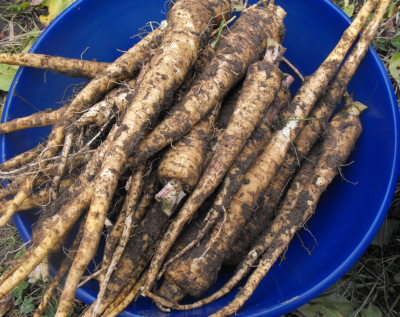 I probably could have left them in the ground a little longer, but the day before Thanksgiving just felt like the right time to dig the parsnips. I ended up with a big bowlful, and the roots slipped quite nicely between layers of damp creek sand/gravel in a large flower pot. They have now become the first inhabitants of our fridge root cellar! Meanwhile, inside, I checked on the carrots I've been storing in the fridge. After about a week, the top layer started to lose a bit of its crispness, so I wet a dish towel and laid it on top. It seems like I need to re-soak the dish towel once a week, but the carrots are now staying nice and crisp. The only problem is that we've eaten half of them already! I guess next year we'll have to grow twice as many. I still have a bed of younger parsnips and a couple of beds of young carrots in the garden. I planted these too late to get large roots this fall, so I'm hoping that they'll overwinter in the ground under a heavy leaf mulch and grow for me in the spring. Check out our Avian Aqua Miser sale if you're looking for a gift for the chicken lover on your list. Or feed your own independence with our ebook about starting your own microbusiness.